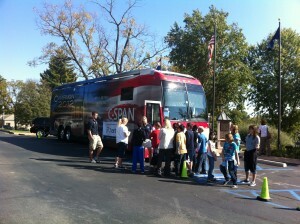 A million-dollar C-SPAN bus is making its way through the Show-Me State on its “Road to the White House” tour. The digital bus is showing students and teachers how they can use C-SPAN as a resource. C-SPAN spokesman Doug Hemmig says the bus tours the country year-round, and not just during election years. He says it’s to raise awareness, and says Missouri students seem to be on top of it. Fulton sixth grader McCala Robinson says she has watched C-SPAN before … a few times with her grandpa. Still, she says she was impressed by the bus and would likely pay more attention to the government channel. Hemmig says the bus offers touch screens so visitors can see all the content available on the network. He says the cable and satellite companies offer the network as a public service … customers pays six cents a month to fund C-SPAN. C-SPAN’s in-depth public affairs event coverage, its web offerings including video archives going back to 1987, and shows students and teachers how it can be a resource to learning. The “Road to the White House” digital bus is making stops in St. Louis, Fulton, Jefferson City and Columbia. From here to Kansas, Texas, Florida and other states, the bus is touring state capitals, community events and schools, giving everyone a look at the network’s educational and political resources. The bus also stops at major political events and meets with votors on the campaign trail.